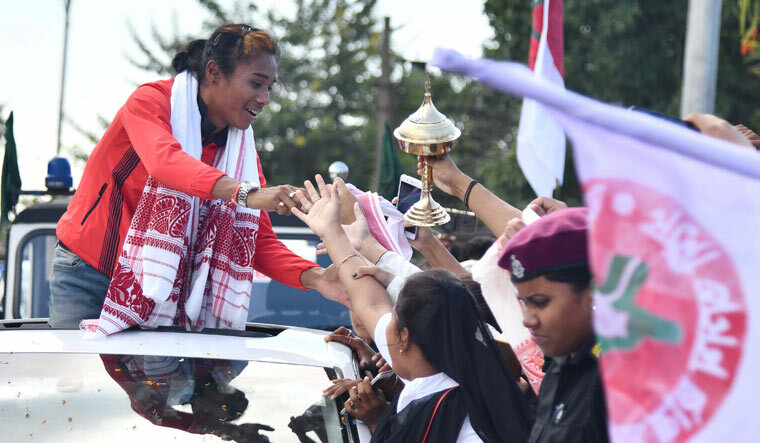 Sprint sensation Hima Das returned to her home state Assam to a rousing reception, following her exploits at the recently-concluded Asian Games in Jakarta. After scripting history by becoming the first Indian woman athlete to clinch a gold medal at the IAAF World U-20 Athletics Championships in Finland earlier this year, Hima followed it up by bagging a gold and a silver in the Asian Games in Jakarta. The 18-year-old sprinter, fondly called 'Dhing Express' after her village, had gone to the Indonesian capital after training in Europe. Hima was received at the LPGB airport by Assam Chief Minister Sarbananda Sonowal and many of his cabinet colleagues with a traditional Assamese 'gamosa' (scarf of honour) around her neck. Her farmer parents Ronjit and Jonali Das were also present at the airport. Escorted out by 25 Assam Police special women commandos 'Birangona', the athlete walked on a specially laid out red carpet designed like a running track with number markings. 'Amar ghoror suwali' (girl from our place), shouted students, sports lovers, political leaders, people from her village Dhing, who were waiting outside the terminal building.  To the beats of drum and Bihu dances, the sprinter, wearing a red track suit jacket with blue jeans, was taken in a white luxury car. The vehicle with Hima standing through its sun roof was part of procession of cars. Hima waved at people lining the road as the cavalcade was led by members of the All Assam Students Union (AASU) on motorcycles. Hima is the sports and culture secretary of the AASU unit in her home village Dhing. The cavalcade had to stop several times as the people and various socio-cultural organisations wanted to felicitate Hima who clinched the top spot in the women's 400m race in the World U-20 Athletics Championships in July. At the Asian Games, she set a national record by clocking 51.00 to qualify for the 400m final and bettered it with 50.79 to clinch silver. She went on to win another silver in the mixed 4x400m relay and bagged a gold in the women's 4x400m relay. On arriving at the Sarusajai Stadium, Hima kissed the track. "I trained here and I always thought that it is from this track that I will go forward. I thank all for making me achieve what I have done so far. I will continue to go forward," she said. "People from Dhing have come all the way here. Because of their love for me, they walked the route from the airport even under the scorching sun while I was inside the car," the athlete said. The Assam government was to felicitate Hima at the Srimanta Sankardev Kalakshetra.